Hey Chris... 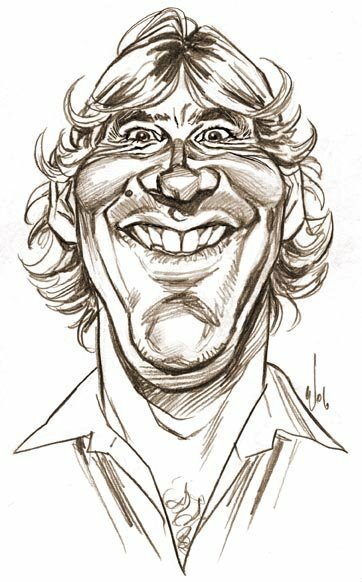 I have to agree with you.... his cheeriness put me off... but has was always entertaining to watch.... and really into what he did.... so that I have to respect... anyways... Great job on the caricatue of him.... you captured him perfectly..... PEACE! And I gotta agree. He got on my nerves quite a bit too and I joked on many occasions how he'd end up on the wrong end of a poisonous animal (in fact... I said as much in an LJ entry some while back), but I do respect the man for being totally genuine in what he believed in and fought for. The guy was the real deal. What a great way to memorize this unique and fun person!! Great caricature, Chris, and I agree with your sentiments word for word - you put it all really well. In a way, the same things that made him Steve great were also the things that could get pretty annoying, but he stood for some good things. I couldn't take the guy to be honest, a bit too much of a stereotype for me. But he had an almost hullucinatory fascination with animals which was obviously genuine. Could help thinking "just stop shouting at it and put it down" when I saw him though. Actually I liked the guy, I thought he'd full and truly made it as soon as he had scored a Hollywood movie, and had an action figure made of both him and his wife. To me he was like a giant innocent child who hadn't grown up, a brilliant example of a man living and breathing the 'Peter Pan syndrome'. And as he was a champion for good (anyone who fights for, protects and preserves animal-kind fits my bill on this), he was on a pretty just course. Sure, he was somewhat rough around the edges, and had a limited grasp of the english language, but he seemed to be a good man within the realm in which he worked, and all that counts for something in my book. He was just a little over the top for me, to be taken in small doses. But I have respect for his achievements, his attitude and his family values. I guess I liked him more as a human being than a celebrity. First up, at what institution(s) did you study/learn graphic design and illustration? And did the knowledge that you learned there have a significant impact on the work you do today? And finally, a couple of questions regarding comic book lettering, and 'lettered comic book sound effects'. I have a copy of 'Adobe Photoshop' and 'Adobe Illustrator' at home, and I want to know the name of a font program I can get so that I can produce industry standard comic book lettering, and industry standard 'lettered comic book sound effects' for my own work. Thanks again Chris for your willingness to answer my questions. Q: First up, at what institution(s) did you study/learn graphic design and illustration? And did the knowledge that you learned there have a significant impact on the work you do today? A: As an artist I'm self taught and never attended any colleges, university or courses to learn to draw. I did however learn a lot from my workmates when I worked at Disney animation. Being surrounded by people with similar interests really helped improve my art. A: I think the (comic) artists who helped influence and shape my drawing style were John Byrne, Art Adams, Alan Davis, Jim Lee and Marc Silvestri. I learnt the basics from John Byrne and Art Adam's work. I learnt to draw women from Alan Davis and Marc Silvestri's work, and Jim Lee for his rendering skills. As far as hair, eyes and clothing, I can't say there was any one artist, but rather a combination of these and many other different artists, taking elements I liked and combining them to create my own unique style. Also with eyes and hair, I learnt portraiture and caricature growing up and that really helped me learn the basics of drawing the face. Q: And finally, a couple of questions regarding comic book lettering, and 'lettered comic book sound effects'. I have a copy of 'Adobe Photoshop' and 'Adobe Illustrator' at home, and I want to know the name of a font program I can get so that I can produce industry standard comic book lettering, and industry standard 'lettered comic book sound effects' for my own work. A: There are many free comic fonts on the internet (at sites like www.1001fonts.com). Ones to avoid are DomCasual and Comicsans. For more professional comic fonts you can purchase fonts from www.blambot.com, or if you're creative you can do like I did and make a workable font of your own handlettering. I used a PC program call 'Font Creator' by High Logic. Thanks Dominic. Glad I could help out.